Still pretty warm in Paris at the moment, but the nice blue sky is now history! 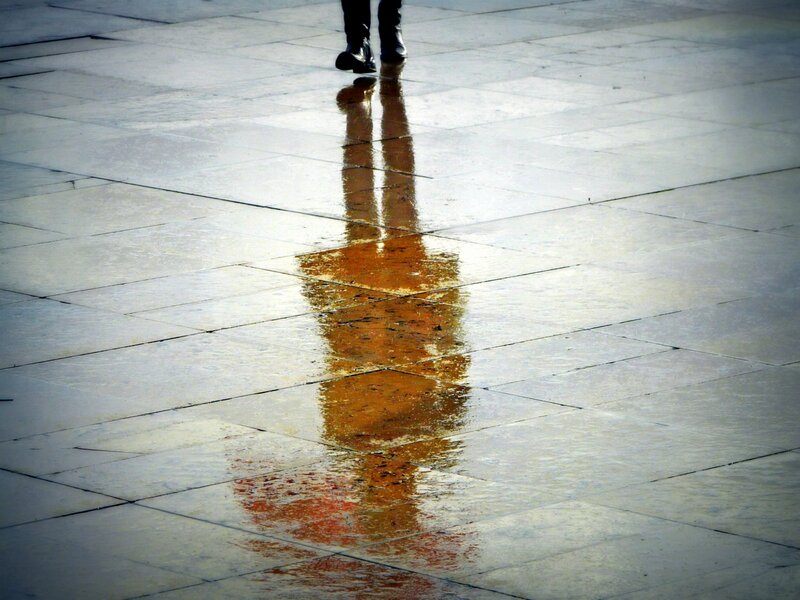 So here is a pretty wet photo today, taken on the Trocadero esplanade. Not very Paris centric I agree, but I thought that since a new year has come, it was time for a little reflection (I know, it's easy ;-)). Have awonderful weekend everyone, mine will be busy eating "galette"! Du galette? Pauvre Eric. Enjoy! This is truly a gorgeous photo, Eric! Well done. Beautiful, Eric. And enjoy your little indulgence! Bonne année et beaucoup de bonheur pour toi et les tiens! Merci de tes efforts quotidiens à nous faire plaisir. Très appréciés! Bon appétit; chez nous aussi, c'est la galette du roi aujourd'hui et demain - on va bien trouver un roi, une reine. We had some sunshine yesterday. Nice tone here. Galette ... Yes for me too !! Threre will be a King (or two) amongst us ! Ha :) !! wonderful shot. happy new year. @Sasho "Du galette? Pauvre Eric." Why Pauvre Eric ?? MS M "Enjoy the galette!" Thanks I will! @ET SUzy "This is truly a gorgeous photo". Merc (and right by the Eiffel Tower! @Shell "nd enjoy your little indulgence!" LOL. Yes I will! @Kiki "Bon appétit; chez nous aussi, c'est la galette du roi aujourd'hui et demain" I would not expect otherwise Kiki, there is NO WAY you can escape it if you live in France LOL (including the office!). BTW people, you MUST have a look at Kiki's lostincheeseland blog. @Stefan "We had some sunshine yesterday. " Yeah, yeah... Stop bragging LOL! @Cn "hrere will be a King" Yes, but a king de pacotille LOL! @Jeff "Don't look back, you can never look back." Er... Don't worry, we get it! Besides would you really want to go back?! Proof that sometimes, easy is good. This photo could translate into a gorgeous oil painting. Do your artistic skills also work on canvas? Eric... Do you have any work from the Pont des Arts bridge? It's a curious place and just crossed my desk today in another passing publication ... The first person I thought of for a REAL SET of shots from there was you.. Appropriate the photo and the thought. Beautiful photo, by the way, I like it very much.